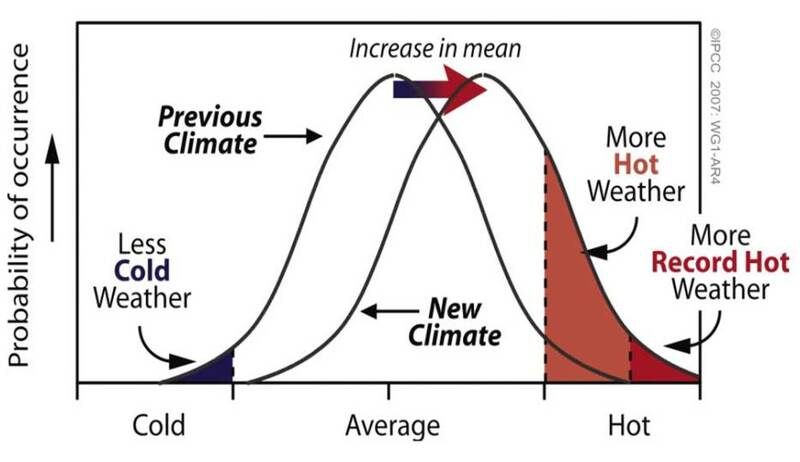 Schematic illustrating the disproportionate effect on extreme and record temperatures when the mean temperature increases, for a normal temperature distribution. Adelaide is the hot place to be right now. We’re in the middle of an extreme, enduring heatwave, and the city’s residents are suffering. Indeed, we’ve had rolling blackouts as the power system fails to meet peaking loads, and more people are suspected to have died from heat stress over the last week than were killed in the infamous Ash Wednesday bushfires of 1983. Now, make no mistake, the month of January in Adelaide is renowned for its hot, dry weather. For instance, back in 1908 the city felt the brunt of a run of 6 days above 40C, and in 1939 the temperature soared to its historical single-day record (still unbeaten) of 46.1C. So given this context, an obvious question is whether the current heatwave is anything remarkable, and can a climate change signal be detected in this event? The standard scientific answer I would usually give is something like this: ‘Extreme weather has occurred in the past, and it is not possible to definitively attribute any one unusual event to climate change. That said, a higher frequency of intense heatwaves like this is consistent with the expectations of a rising global temperature‘ (see figure showing ‘more record hot weather’). But in the case of Adelaide’s 2009 heatwave, a bit of deeper investigation does indeed suggest that a climate change link is very likely. Starting on January 26, we’ve had daily maxima of 36.6C, 43.2C, 45.7C [3rd hottest day ever recorded], 43.4C, 43.1C, 41.1C, 40.6C and 38.8C. This also included the hottest night ever recorded in South Australia, when around midnight on 29th Jan, it dropped to a minimum of 33.9C. For the last 5 days the temperature has not dropped below 25.9C at night. The run of 6 days above 40C equals the record from 101 years ago. The current 5-day forecast is for 38C [update: actual = 36.3C], 38C [33.0C], 37C [35.6C], 40C [43.9C] and 34C [41.5C]; if this holds, we’ll have had a string of 12 days above 35C, or perhaps 13 if Saturday nudges up a degree or so over the forecast. The heatwave is hitting more than Adelaide by the way — Melbourne got its 2nd hottest day on record and Tasmania its hottest ever. The town of Kyancutta on the Eyre Peninsula sizzled at 48.2C. Historical records from the Bureau of Meteorology show that there have been 6 previous ‘heatwave events’ (here defined as >35C) that lasted 8 days, many more of 7 days, more still of 6, and so on. This is useful information for analysis, because it turns out that the return time of any given string of hot days is logarithmically related to it’s length (see below for how I know this). From Bureau records, we can infer that if the current heatwave does last for 12 days, such an extreme outlier should only occur, by chance (i.e. if the climate is not trending), once every 400 years or so. If it goes for 13 days, then that’s roughly a 1 in 1000 year event — such is the nature of a logarithmic relationship! Statistically speaking, there is always a danger in extrapolating beyond the bounds of your data, but in the case of rarely (or never) observed events, there is little other empirical recourse (a mechanistic simulation such as a general circulation model would also give useful inference on this matter). So why might I be as bold as to suggest a climate change link with this current heatwave? Well, the hottest night ever recorded is certainly notable, and is consistent with the expectations of a greenhouse gas (GHG) induced warming. You see the basic hypothesis goes that if solar forcing is causing the surface warming, we’d expect there to be relatively more hot days (when the sun is shining) compared to hot nights (when the sun is hitting the other side of the planet and the warmth is maintained by the insulating effect of GHGs and high altitude clouds). If it’s a build-up of GHG that is driving the warming, you’d conversely expect relatively more hot nights, because the ‘atmospheric blanket’ has thickened. Another way to think about this commonsense prediction is to consider deserts, which have few high clouds and so tend to get very cold at night. Or in the extreme, to look to the Moon, which has no GHG at all and so has daily temperatures soaring above 100C and night times plummeting to below -100C! But let’s not read too much into one extremely hot night in Adelaide — it could still just be unusual weather, after all. Better in this case to reflect on large meteorological data sets which quite clearly confirm the GHG prediction, showing that relatively more warming has occurred at night compared to the day time. Another nail in the solar warming idea (but that’s another story). What exactly do I mean by this? 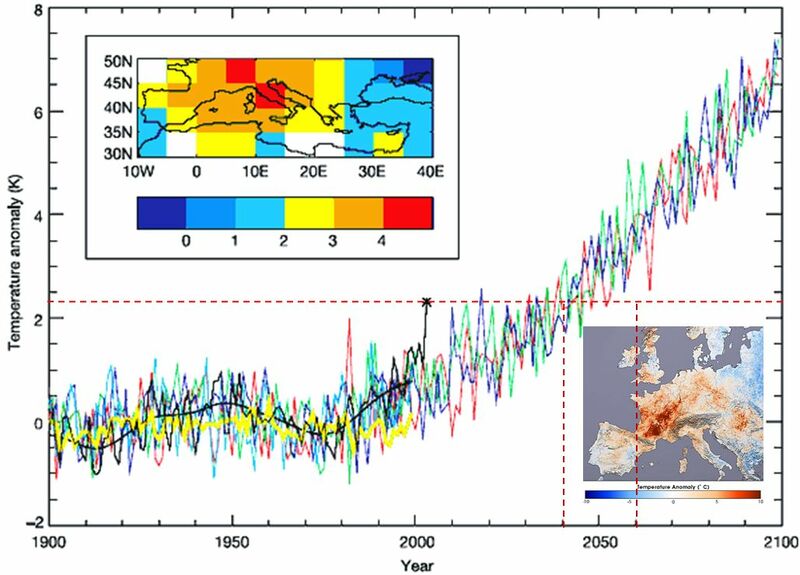 Well, the heatwave that struck Europe is 2003 provides a good way to illustrate my final point, thanks to a neat analysis published in Nature in 2004. The authors of this study estimate that warming to date has at least doubled the probability of such an extreme heatwave occurring. Moreover, under ongoing heating, climate models suggest that by 2040, this extraordinarily hot summer (in historical terms) will be just a run-of-the-mill average summer. By 2060, it will be among the coolest of summers the future residents of Europe will thereafter ever experience. The European heatwave of 2003 in historical and future context. The black line shows recorded summer temperatures in Europe, with the cross showing the extremely hot summer of 2003. Also shown in various colours are some climate model simulations which match historical records and project ongoing warming under a scenario which includes only a gradual reduction in human-caused greenhouse gases. Climate variability is superimposed on the warming trend, but the impact on extremes is also clear. Following the red dashed line it is clear that by 2040, the anomalously hot summer of 2003 with be merely an average summer. By 2060, it will be positively chilly. Now, I just remind that 2003 European heatwave also released equivalent of 4 years of carbon assimilation of stored carbon dioxide. If 2003-like events have return time 3-5 years (in 2040? or sooner? ), I bet that European forests will become significant SOURCE of carbon dioxide. Another positive feedback kick in! Now, how are we gonna stop that? A very timely post. How many times do we have to get a once in N years run of hot days before we say it is due to a changing climate with 90% probability? I’m not asking this in a rhetorical sense but in a quantitative one. The ANU scientists have come up with a solar powered air conditioner (which also provides hot water and space heating for winter)using one solar collector and estimated to cost no more that the three systems (a/c, heater and water heater) it would replace. This is the the sort of advances we really need. Thankyou science! this is good news, indeed. But science is not the ultimate answer – we need to stop growth – already today we are living beyond our means – we need 1.3 of planet Earth! More than ‘superficially interesting’, Nick. I’d call it more like ‘ominous’. An interesting post, particularly re the warmer nights…. Some years ago, there was a lot of discussion about the southward shift of the westerly jetstream, over Southern Australia…. Could this be influencing the recent extreme weather in Southern Australia ?…. Could the southward shift of this weather system, foretell a permanent shift in the climate, of Southern Australia ?…. Is the southward shift of this weather system associated with anthropogenic climate change ? I certainly agree with you that we should all lower our expectations of consumption e,g buying multiple plasma TV’s and endless junk from China and elsewhere, but when it comes to a comfortable existence we have to be pragmatic and realise that people are not going to want to put on a hairshirt and suffer needlessly. House sizes should be reduced to modest proportions and energy efficiency improved thus reducing the amount of energy needed to be comfortable. Heating, cooling and hot water are some of life’s luxuries and we are fortunate to have them, however instead of asking people to go without we should be encouraging the supply of systems, such as the one I linked to, which use the sun to run them and will reduce our carbon footprint. Some people, myself included, suffer from various illnesses/syndromes which leave the body unable to maintain a reasonable temperature in extreme conditions. Also elderly people, the infirm and young children are much more likely to die in temperature extremes – witness the recent deaths in Adelaide and Melbourne and the huge numbers who died in Europe during their 2003 heatwave. To these people heating and cooling are a necessity not an optional luxury. We have high certainty about the strongest factors that contribute to warming (CO2 + CH4 + N2O + Halocarbons = 2.6 W/m2) http://www.ipcc.ch/graphics/graphics/syr/fig2-4.jpg . And we have low to medium confidence about the warming and cooling contribution of other smaller contributors to radiative forcing (Ozone + CH4 water – albedo –aerosols + solar irradiance = -0.9 W/m2). In short we have high confidence about GHG forcing temperature change by 2.6 W/m2 and low to medium confidence about smaller contribution forcing a net temperature forcing of –0.8 W/m2. If this is your argument then it sounds accurate. There is even a remote chance that our contribution to warming is below best estimate and contribution to cooling above best estimate. However the chance of every component going to the 95% confidence limit (in the direction consistently needed) is of a probability of 0.05^10 = 1 in 10,000,000,000,000. “Ken Lambert writes: In the beginning was the number, and the number was 1.6W/sq.m. Why don’t your readers attack me instead of poor old Tamas Calderwood (Monday, comments). Probably because they might not have understood my points which Crikey kindly printed last week. A layman’s look at Fig 2.4 (pp39 of AR4) is indicative of the scientific rigor of the IPCC. All the heat-up forcings (C02, N2O, Ozone) have high and medium levels of certainty (LOSU — level of scientific understanding); and all the cool-down forcings (surface albedo, direct aerosol and cloud albedo) have medium to low LOSU. So the arithmetic sum of the averages of unequal terms is taken and the result of 1.6W/sq.m positive forcing obtained. It could 0.6 or 2.4 – so lets call it 1.6. For a start, adding in high certainty positive forcings and subtracting low certainty negative forcings is bound to produce a slanted result; in this case on the positive side. Think about it! Expressing this in accountant’s terms; imagine that you know your revenue (sales) with a high level of certainty, but your expenses with a low level of certainty. Subtracting the two figures will give you a difference with a low level of certainty — in fact the absolute uncertainties of the terms of a simple subtraction will add together. You could make a big profit or a big loss! Furthermore, the application of heating power (forcing) to the surface of the Earth at a rate of 1.6W/sq.m. should raise the average temperature of both air and ocean. If this does not happen over a period of several years (excluding the seasonal summer/winter variations), then the 1.6W/sq.m. would logically be a wrong number. It could be 0.6W/sq.m. or zero or a minus number i.e. the Earth is losing heat. All the cooling “forcings” — surface albedo, direct aerosol and cloud albedo are admitted by the IPCC to have a medium to low LOSU (level of scientific understanding). Oh, what a lot of baloney, Mark. However the chance of every component going to the 95% confidence limit (in the direction consistently needed) is of a probability of 0.05^10 = 1 in 10,000,000,000,000. Mark, that’s just it – all the forcings need to be at the lower bound to imply no net human forcing – and the observed temperature rise (an outcome, not a basis on which the radiative forcings are calculated) does not support such an extreme aerosol offset. My figure provided here illustrates your point. This reminds me that I have to do part II of this post soon. Just to put my previous comment into perspective – sorry to sound so snippy – the idea that the estimates of the various forcings could be shown to be logically wrong on the basis of “several years” of data is just not very sensible. The comments on Crikey by Lambert and Calderwood are red herrings. In effect they are arguing that (a) the climate has not heated up and therefore this must mean (b) the forcings scientists are least certain about must have been incorrectly estimated. It’s an attempt to skip to (b) gloss over the fact (a) is wrong. I mean, when people come out with non-sequiturs like “recent temperature changes are within normal variability” and blatant cherry-picks like “temperatures have plateaued and dipped such that the Earth’s current temperature is no warmer than it was in 1983” then you know what follows will be disingenuous bilge. Are the IPCC error bounds 95% confidence as I have assumed? Mark #16: The radiative forcing error bounds reported in IPCC 2007 AR4 are 90% confidence intervals. Which I belive means the probability is 0.1^10 which is exactly 1 in 10,000,000,000. I gather yesterday was only 33 degrees – that’s global cooling for ya! MattB, yes — my rough re-calculation makes it a revised 1 in 150,000 year event now instead of a 1 in 1,200,000 year event. But what’s a couple of ice ages or 18 times the span of human civilisation among friends? It does raise another interesting issue. One day that was 1.5C below the arbitrary 35C mark breaks the run. Today was over 35C again and tomorrow is expected to be hotter. So I start to ponder on what the ongoing high average temperatures mean in historical context, or how this might be better quantified. The analysis of Dr Grace was, after all, categorical and threshold based and therefore ignored some useful embedded information (such as how hot the hottest days were in combination with the overall length, and how hot the nights were, etc.). Just picked up a small error, Adelaide’s record-smashing 15 day March 2008 heatwave, the graphic dates are 2007? I’d be interested in seeing 2008 global mean temperature compared (9th hottest recorded) to previous years with La Nina, previous years with sun spot minima and previous years with combination of La Nina and sun spot minima. Are you aware of any such comparison? Good to see this interest in the calculation of climate forcings. Below is the text of my 11th November 2006 blog on Climate Thermodynamics which provides a broader context to the politics of climate forcing assumptions. Would the shift in the PDO to cool, the 3rd year in a row of La Nina and the dearth of cycle 24 play a part in your weather? News of your wildfires saddens us all worldwide. Is there any gain that would come from producing this post as a peer-reviewed paper and as well in spreading this information? Would that in some small way help gain some benefit from these terrible events….. If it would brighten these dark days, take a look at something hot, wet and furry from down under ! I just posted this on Bolty’s blog (not that it will do any good) however have you seen the list of historic bushfires in Australia? 1926 1939 1967 1983 2001 2003 2006 and now 2009. You would think that even the stupidist denier could see that major bushfires are becoming more common in line with predictions. Good point. One of the replies was that the Canberra fires of 2001 and the Eyre Peninsula fires weren’t bad enough to be classified as major. I replied that perhaps he/she should tell that to the people that survived the fires and he/she might get a bit of an argument. Ender, in terms of area burnt, NSW 1994 and the fires throughout the Australian Alps 2002-3 should be on that list. Clearly property damage and loss of life are the major criteria for inclusion. The 1938-46 drought brought some big fires, I think. Does frequency of bushfire have more and more to do with human behavior (and misbehavior)? Arson, accidental ignition and burn-off escape are outdoing lightning as sources. Given the latitudinal extent of the continent and typical position of passing pressure systems, most summers in southern Australia will have the perfect combination of low humidity ,high temperature and strong north to westerly winds at least on a few days, often more. Put that inside a couple of dry weeks and add humans. With population increase and expanding urban/rural residential boundaries, there are more sociopaths to light fires and many more people to be caught in their path than ever before. I think it would be pretty difficult to extract a AGW quotient from those moving factors, even as it leads to an increase in hot days. Perhaps AGW induced drought is as important as extra hot days. IOW, as a backdrop to truly extreme events, all contributing factors for southern Australian bushfires are increasing signs. Can we untangle the signals? Moving north, once you reach the zone of dominant summer rainfall, dry winter/spring seasons become the fire danger times, but the shorter days and relatively cool weather generally makes bushfire less potent until well north of the tropic. As well, this is the only time of year when authorities can reliably schedule burning off, as summer swings between being too wet and too dangerous. Conditions suitable for major summer fires are less frequent than further south. The exception would be the coastal sand masses and barrier islands, with their heath, breeziness,high human visitation rates, and ,in the case of Bundjalung National Park, the misfortune of being downwind of a town, a bombing range and a major highway; there is a fire there every year. A very thoughtful post. People on one side of the AGW debate are rushing to pin the Victorian tragedy on climate change whilst people on the other side are rushing equally fast to pin it on anything else: greenies preventing forest access and fuel reduction burning, mass-murdering arsonists etc. Given all the issues you raise I can’t see the sense in people seeking to elevate the importance of climate change to a key causal factor behind Saturday’s events. It may well be a enabling factor in increasing the potential frequency of such events, but surely the time isn’t right to be making a far more subtle argument like this. That said, the original contention of Barry’s post seems more than reasonable on all the evidence. Allan, It IS most unfortunate that these connections need to be made at this stage in the current tragedy. However the media cycle will move on and the political responsibilities will also slip by. Hence the endlessly tried strategy of scientists remaining aloof and subtle cannot be maintained. This strategy has failed and it is costing lives now and will cost astronomical numbers later. I suggest the stakes are obviously too high, the gloves must come off and the climate emergency declared loud and clear. There’s a very simple way to show your probability estimates must be wrong. If increased CO2 is causing Adelaide to warm, what’s the probability that the heat-wave record still hasn’t been broken after 100 years in which the CO2 concentration increased by 35%? Now if a run of 6 days above 40C was a 1 in 100 year event, we’d expect to see one (on average) every 100 years or so (but it could revisit sooner, or later). Let’s say global warming so far had doubled its frequency — it would now be a 1 in 50 year event. In this case, seeing another in 2009 tells us nothing particularly helpful — too little data. To answer the question of probabilities, I’d need to see the return time data for other durations of day sequences above 40C (2, 3, 4, 5). I don’t have that data to hand, but would be happy to analyse it when I get hold of it. Clearly you are claiming Adelaide’s warming is due to increased CO2, and not, for example, urban heat island effects, or natural variations such as the PDO. If you are not claiming that then why this blog at all? It’s easy to estimate the likelihood of 6 days above 40C given a 1 degree rise in temperature: it’s equal to the frequency of 6 day runs above 39C before the 1 degree rise. The graph you link to suggests temperatures didn’t start to rise significantly until the mid 70s, so you should be able to just count the number of 6-day runs above 39C from the mid 70s back to when records began. Oh really? You’re assuming the the mean has changed but the distribution around it has not. You could be right, but you should be aware that this is the assumption you are making. I find it interesting that skeptics tout “urban heat island” effects as an alternate explanation of apparent global warming without realizing that it means that human activities (urbanization) cause warming (in and near cities) which increases the average global temperature unless there is a corresponding causally linked cooling elsewhere to exactly balance thing out. Another explanation for heatwaves in Southern and S.E. Australia, prolonged drought and bushfires comes from a study by Dr Caroline Ummhofer and Professor Matthew England of the University of NSW Climate Change Research Centre. This study ties the Indian Ocean Dipole currents to drought conditions in Australia. I would suggest that Barry already knows of this study. The worry is that this just exacerbates the problems. In fact the oceans are already heating up due to global warming and it is this warming that is changing the influences of the Indian Ocean on our climate. Higher ocean temperatures are a function of higher CO2 levels. This is the driver of climate change. JeffT @46, the paper you refer to isn’t exactly “another explanation”. So it proposes a mechanism for drought, but not for the warming trend in air temperature, nor presumably for stronger winds, which as we know “make matters worse” by increasing evaporation and therefore exacerbating the effects of lower rainfall on farming, bushfires, etc. So I suppose it would explain the timing of the extended dry period that made destructive bushfires more likely, but it wouldn’t explain why bushfire conditions were so much worse this month than they were in, say, January 1939. Yes I would believe that Prof Brooks does know of this study. “In fact the oceans are already heating up due to global warming and it is this warming that is changing the influences of the Indian Ocean on our climate. Higher ocean temperatures are a function of higher CO2 levels. This is the driver of climate change.” As the explanation you have given. The UNSW article does not deny the existence of global warming, but does offer that the IOD interacts with the Southern Australian climate on a cyclic basis, resulting in extended droughts and extremes of temperature. In this recent conflagration, I cannot say that this is the case as I cannot find any records to correlate pressure systems with incidents of fires. Listen to this audio in which the scientists involved explain the research. Since the 1990’s there has been no negative phase of the Indian dipole and this is the one which is believed to bring wet conditions to south eastern Australia. Prof England is concerned at the frequency of drop off of this phase which is showing a definite trend which may or may not be as a result of global warming. More research is needed. that it would be the audio release of the document “Indian Ocean causes Big Dry:” I linked to in #46. My answer to Gaz #50 re the “Blocking High Pressure” as the answer to strong dry winds, mostly of N – NW, as has shown up in the fire reports, also showed up again last night 24/2/09 on the weather charts and fire warnings. A high pressure area SE of Victoria, accompanied by strong northern winds. Having further thoughts on reasons – something which has shown up over recent times is the Asian Brown Cloud (ABC), the results of ever increasing industrial pollution,increasing motor vehicle pollution and burning of wood and other biomass such as dung and agricultural waste for cooking and heating.This is known to have effects on the Indian Monsoons. Has some interesting reading in it. In the section sub-headed Temperature also mentions “persistent blocking high pressure systems” located in southern Tasman Sea, as a source of higher temperature. Thanks for the links – interesting stuff showing the complexity of the climate systems. Let’s be grateful that we have scientists dedicated to unravelling the changing climate. I think pseudo-sceptics of the science have no notion of the complexity, otherwise they wouldn’t blithely post some of their ridiculous ideas, believing that they have the necessary scientific knowledge to challenge peer-reviewed science. It is, of course, fine for genuine sceptics to pose their questions – we only discover the pseudo-sceptics when they repeat their queries ad nauseam, refusing to accept the answers given if they don’t fit their misconceptions. Things are changing greatly down here in SW Gippsland. We have higher temperatures than before and of particular note is the fact that these high temps are not just occuring with a hot North wind. The day can be very still and yet very hot – the heat seems trapped, maybe as a result of these blocked high pressure systems. Also we are not getting the welcome sea breezes in the afternoon or the predictable southerly changes. Rainfall is the lowest on record for this time of the year (we used to get squalls and thunderstorms from the sea) and many plants have been scorched and subsequently have died – not just exotics but also some local indigenous plants. This is a local climate out of sync. An interesting irony would occur (as you would know) if the Asian Brown Cloud was greatly reduced by the current economic crisis – at present it is helping to keep temperatures down globally because it acts as a shield against the solar heat – depletion would undoubtedly cause global temps to rise further. I am sure Barry has already posted on this. You must remember that the 2003 heatwave in Europe was a freak event. There has been nothing like it since, and subsequent Summers have been generally wet, often very wet. People mustn’t read climate change in to one off events. You must also remember that this bushfire of 2009 is the latest in a line of extremely hot bushfires since 2000. 2001, 2003, 2005 – all serious bushfires – fortunately most of them, with the exception of the Canberra fires, were not in populated area, little infrastructue and no lives were lost, so they have been convieniently forgotten by the pseudo sceptics. We were however, told by the CFA that these bushfires were not able to be fought because of the intensity of the heat and the ferocity of the firestorm. Climate change predictions are not for increasing heat everywhere – rather for increasing intensity of weather events like cyclones, bushfires, precipitation etc. Witness the excessive rainfall in Queensland and NSW this year. Also don’t forget that we have had the driest start to any year on record, the hottest temperatures on record, the unheard of night time temp of 41 degrees, at 3.06am at RAAF Edinbugh, SA – all of these phenomenen have been predicted by the IPCC. Unfortunately, they are now appearing to occur earlier this century that was expected. A little research ( see Google search above) reveals that you are wrong D.Price @ 55. Heatwaves in Europe also occured in July 2006 and July 2007. What about the two Adelaide heatwaves in March 2008 and Jan 2009 – 10 months apart. The odds on this happening – 1 in 150,000 years according to Barry’s post above. “Heatwaves in Europe also occured in July 2006 and July 2007. What is the period of weather change that would be considered climate change? says:- 1922/23 – 1924/25 did not record any cold days (in winter) in Central England. And a nice map from Rootsweb ‘New World Atlas and Gazeteer 1922’ showing at least two expeditions in WOODEN BOATS circa 1851 – . Shows it has melted before on a regular basis. You quote figures of heat related deaths. Also figures have been put out about the loss of life due to people being afraid to switch on their air-conditioners due cost, ramped up by carbon charges on their electricity. This fact could bias your death figures. Time will tell of the cost to life of the current freeze across US/Canada, Europe and Russia, China and Japan. This would also have to include roof collapse in areas that the snow level is un- precedented. Perusal of these areas by real time webcam, will show how effected they are. For clarity, JeffT: is it your underlying argument that hot historical temperatures in central England, and heavy snowfall in winter in the northern hemisphere, show that the Earth isn’t warming? Of are you simply making the general point that extreme events have happened in the past, and that current extreme events can therefore not be attributed to climate change? Post #58 was in response to Perps posting @ #57 of various links to Northern Hemisphere conditions. It was not meant to be taken as “the Earth isn’t warming” tome. Professor England also does not discount to effect of Climate Change. I posted that link to show that there may be other factors in play besides AGW. Later I posted a link to the Atmospheric Brown Cloud, that studies show is having effects on the Indian monsoons, a subject you touched on re your trip to China. Is there a link between the A.B.C. and decreases in local Indian Ocean SST and changes in rain precipitation, and effects on the I.O.D. ? —- and effects on our SE Australian climate? JeffT, Mugwump and all the others vehemently claiming that last years heatwaves were nothing new and a normal part of varying weather – WHAT DO YOU HAVE TO SAY NOW! More records tumbling in SE Australia and the spokespeople for BOM now saying outright that this is the result of AGW as predicted. Yes Adelaide/SA is having records broken? – at the moment. Or are they records? What about the mid 1800’s and the Federation droughts, or are you only using recent records(last 15 years)? On the Mid North Coast it’s nice and balmy, has rained a bit too much (appears to fit in with the normal cycles -eg. ~22 years). During October there was skiing snow on the Alps in Victoria and NSW Kosciuzko (you could see it on Snowcams). , an increase of 3,731,250 sq kms. But that must be weather as well. Stay cool over in SA ‘perps’, drink plenty of water – it will get better, it’s only weather. Why relate “heat stress” to the loss of life of the Ash Wednesday fires. It’s about as irrelevant as comparing lives lost through “heat stress” with American casualties in Afghanistan over a two week period. I will agree with Barry Brook on Nuclear Power, because without a reliable power source, increasing population, urbanisation-roads/concrete – UHIE, air-con, and I almost forgot Global Warming, you will have more victims of heat stress at times of ever increasing black outs. Climate change means just that – the examples you gave agree with the predictions that the climate will change and extreme events become more frequent. That means hotter longer runs of high temperatures ( now happening more often than at any time in the past records)or more frequent and intense rain or colder than normal periods, more snow etc. All that fits in with the conditions you described in Australia and around the World. For some reason the link didn’t show blue as normal – I’ll try again. If this doesn’t work can you fix it Barry? In this clip from the “7.30 report” both John Nairn from the Bureau of Meteorolgy and Euan Ferguson fro SA Country Fire Authority attribute tthe conditions to climate change as indicated by the IPPC who now say that a trend is emerging. John Nairns also explains why we are seeing these extreme heatwaves – high pressures keep re-establishing over SE Austalia without the intervening lows which used to bring cooler southerly winds.John Nairn also stated that the record from 1894 had been broken – going back slightly longer than “15 years”! You of course have heard of the Catlin expedition? They set out to prove the Arctic sea ice was diminishing,by using GP Radar, and hand drilling to check depth. This episode nearly cost them their lives, as the weather closed in and stopped the rescue plane from arriving to save their stupid a—s. Oh yes the rescue plane landed on the sea ice, didn’t fall through, rescued the dills, but left fuel from their expedition behind, to pollute the sea ice. It appears as though this was a Global Warming stunt that went seriously wrong, sponsored by an insurance company. showed ice thickness greater than expected. Umm, I suppose this proves AGW as well? You will be aware that the loss of ice from the Greenland ice sheet (as opposed to the melting of sea ice) will raise the sea level by metres not centimetres. That glacier is also known as Jakobshavn, West Greenland. It has been known for around 100years that it has been retreating. It’s also a tourist area. Shows it’s decrease is also cyclic, last time around 1920. This may not be peer reviewed, but pictures are worth thousands of words. As you are making me aware of the raising of sea levels by metres not centimetres, my answer to that is “Dubai”. Google Earth Dubai U.A.E. and have a look at how those foolish Arab financiers and insurers, developers and engineers are throwing billions of Arab petro-dollars into the rising sea levels, by building marinas, islands such as Palm Jumeirah, which was started in 2001, residents moved in late 2005. Trump has an International Hotel and Tower (Dubai) there. The Arabs also have the temerity to put luxury beach resorts on islands (The World Island development ), a group of 300 man made islands at beach level. Long time since I’ve heard from you. Which equates to the land areas of NSW, Victoria, Tasmania, Queensland and about half of South Australia – just in the sea ice increase. And you know that JAXA don’t show ice cover under 25%, and that’s only the edges. Of course the sea ice is increasing – IT’S WINTER! The predictions are for an ice free Arctic IN SUMMER! As for Dubai – all they will have left are submerged assets. A phenonoma which will be all too frequent around the World. and forget about getting insurance on your property at any price. I say none of this with any pleasure – we live by the beach! Oh and BTW your link to CO2Science.org is worthless – a right wing denialist site can hardly compare with the prestigious journal ‘Science” from which my link emanated. Most thinking people, quite rightly, will give credence to legitimate science organisations and their y links which don’t fit the peer review criteria – it just makes you look even more stupid and desperate. And here’s one from NASA just for the “it’s been cooling since 1998” deniers. The five hottest years- over what time scale, and where? Death Valley doesn’t count. Next thing you’ll be telling us is you believe MBH98. (Yes I have seen Barry’s funny ha,ha, on McIntyre and Mckitirick.) But I notice that it was pulled from IPCC AR4. There are other references to cyclic and 1920-30 period to do with Jakobshavn, that are not from a “right wing denialist site”. But you won’t accept ANY contrary report. Stating the obvious, of course it’s GOING into winter in the N.Hemisphere, and the sea ice is increasing, and will increase until at least mid March, and it is ahead of the few previous years since the low ice period. And you will counter with why the low ice cover? Watch the animation of the 1998 -2008 and see what happened to the sea ice, Each year as the thaw happened, you could see the sea ice move away from the Bering Sea and drift toward the eastern coast of Greenland. The Russian floating polar weather station NP36 also followed this flow. More likely warm N Pacific currents flowing up through Bering. And your opinion on Dubai? Do you think that you are qualified to make that off-handed judgement. As I stated, the Arabs aren’t stupid, especially with money. As I have posted before here, peer review=old boys network. If you’d like peer review, I do have some Russian peer reviewed work I can site, but this isn’t about competition is it? The link to CO2 Science showed PICTURES – peer review??? Don’t think so. “it just makes you look even more stupid and desperate.” does not become you perps, in fact it looks like your desperate, verging on an ad hom.attack. I haven’t seen piece of coal for years, and I agree with Barry B. about nuclear power. as I would like to see our birdlife protected from destruction. I use solar for hotwater. I am converting my lighting to LED and solar PV for lighting only. But it is for energy conservation not CO2 reduction. The ABC hasn’t been the the people’s ABC since David Hill was in the saddle. Currently I believe it stands for Australian Bolshevik Collective. Maybe – Always Biased Commentary would suffice. You might as well get Al Gore to supply the news feed. Your link NASA shows input to the discredited Dr James Hansen. Very believable – NOT. Every 10 years he predicts dire consequences, and ten years later when it doesn’t happen, he adds another ten years. Like just recently he had an anniversary of his predictions. I watched the Youtube – peer reviewed of course. If we had listened to Hansen 20 years ago we’d now be under 20m of sea water. Glug, I too live o the coast. On James Hansen, another place I have seen him interviewed was on – wait for it – Supreme Master TV, our cult lady Ching Hai. Very credible???? ?, how desparate can you be for an audience? But I believe she pays well for an interview. La Manga del Mar Menor in S/W Spain. But I’m happy to report it is going well and settling in, you can buy real estate there. After they sued Greenpeas for 27million euros for distributing literature and altered pictures showng the development flooded an devaluing their property. As we have gotten of the subject a bit, coming back to is there a link to Adelaide heatwave and global warming. Since the DCC & W have taken charge of the BOM and it’s records, I have found that there does not appear to be any acces to historical climate records. Anything else would not be peer reviewed. In my non-expert opinion only about 1.4% of it. These extremes do not have average temperature over any period, but would they would not be just one off events. Sorry for repeat posting, but 1:48am I was half asleep. I will ignore all the previous rants about Nasa, Hansen etc.because they don’t deserve a reply. We are not talking about HIGH TEMPERATURES per se – we are talking about HEATWAVES – day after day of unseasonable heat which is what we are seeing now and what was predicted by the IPCC reports. As to all the fools in Dubai, Spain and elsewhere – would they be the same financial idiots who set us up for the Global Financial Collapse? They didn’t see that coming either! Greed got in the way of fiscal prudency and commonsense which is exactly why they are behaving in the same way regarding injudicious planning and building despite clear eveidence that the sea level is rising and storm surges are worsening. That’s it for me on this thread – I’ll leave you to it JeffT – enjoy! If this lil’ old bod questions the validity of that data by posting an alternative, from an authority such as Perth weather centre, for Australia and US data from the NCDC Extreme Temperature records, the true warming believer get in a tizzy, takes his bat and ball and goes home. I’m a fence sitter, but no wonder the few climate sceptics ( from Al Gore , or was it Penny Wong?) are now turning into a flood. Predicted by the IPCC reports? Umm, which IPCC report, and by which of the 65 scientists wrote it into the report. Was it AR3, with MBH98 hockey stick in it? All those fools in Dubai, Spain and elsewhere ? (your words perps ) – they’re still building, investing all those petro-dollars wisely into their own terra-formed real estate. I betcha didn’t go and have a Google at Dubai..
“Castles of sand” from The Age yesterday and today. I reiterate, Jeff T, they have the same imprudent fools in Dubai as there are in the rest of the world. So do you still insist that they are such clever, astute investors? You’d be on your own if you did! This is just a small selection of the current articles. Here’s an idea Jeff T – why don’t YOU have a go and Google Dubai now! Yes I am aware that they are having the same sort of investment problem that caused the GFC. Whether they made the wrong investments at the wrong time is irrelevant to the sea level rise argument. They probably have the same computer modelers as Lehman, Fanny Mae et al.- oh and I forgot, how silly of me (LOL) the computer modelers of the IPCC and East Anglia CRU. No EA-CRU wasn’t just computer modelers was it? More like weather science fiction writers. Yes perps, I also am wading through the original emails and data from EA-CRU. Not a pretty sight, with things such as the comments on the death of Australia’s John Daly. The ultimate warmista ad hom. – applied to a deceased person. Typical!! “We are not talking about HIGH TEMPERATURES per se – we are talking about HEATWAVES – day after day of unseasonable heat which is what we are seeing now and what was predicted by the IPCC reports”. Were these predictions made by the same people that have used selective data from massaged sources such as EA-CRU? In light of the fact that there is now a petition on the No10.org.uk website calling for EA-CRU to be shutdown, does BNC take the same attitude as Real Climate that the CRU emails were only a blip and will go away? UEA-CRU can’t be too worried about their data as, sensibly, they plan to release it to be dissected by deniers and climate scientists alike. 95% of the CRU data already released – the rest to follow. Isn’t it the only course of action? Could they otherwise use the excuse of the “shredder ate the documents” or they had a HDD failure? I hope they explain the vexatious attacks on Steve McIntyre and their explanations re – Mann, Bradley Hughes and Briffa and their dead wood. And the email comments re John Daly’s death. Is this typical of climate scientists ? Another angle – from the US House Committee on Energy and Commerce. This is a shortened extract on the Wegman Report, the full pdf is available. As I know you like reading my non-peered reviewed references, here’s another from that dreadful old electronic rag, Times Online UK . Please read the comments – priceless ! ‘Specially the one about the Inland Revenue. Beats “The Dog ate my homework” every time. Came to this site because I am looking at temperature changes in Adelaide. Am thinking of moving back there after 15 years but uncertain about affects during next 20 years. My bi-annual visits have shown me many disturbing trends in low rainfall, high temperatures and stressed vegetation. This is certainly impacting my decision as I don’t want to buy a house in a place that will be a desert during my life time. The BOM report is certainly sobering at least to all but trenchant deniers of the science.